An exhibition by Montreal-based artist Jessica Eaton, titled ‘Pictures for Women’, by artist Jessica Eaton is on view at Higher Pictures gallery, New York, through March 4, 2017. The exhibition presents two new series of paintings by (b.1977, Regina, Saskatchewan) in her third solo with the gallery. The first series on view, ‘Pictures for Women’, is a tribute to the works of eminent female artists; while the other series in the exhibition, ‘Transitions’, builds on the additive color experiments from her celebrated 2010-2014 series “Cubes for Albers and Lewitt”. 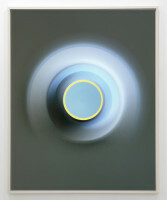 The artist’s extensive techniques, informed by her implementation of color theory and optical science, questions the objectivity and singularity of vision and the photographic images. Generating form from photography’s relationship to time, Eaton transforms the physical elements of painting into a secondary abstraction, interweaved with rich art historical references and elements. These works carry the traits of Lazlo Maholy-Nagy’s “New Vision”, Berenice Abbott’s scientific innovations, Op art’s illusionary effects, along with Kinetic Art’s representations of motion. Through her visual experiments, Eaton attempts to establish the notions of multiplicity and mutability, rather than the common predominance of sight in perceiving art.